In a large bowl, remove the chicken from the bone and shred the chicken. Set aside and discard bones. In a large skillet over medium high heat, add oil, onions and garlic, cooking until softened. Add chicken, soy sauce/tamari, pepper and vinegar. Allow chicken to simmer in soy sauce and vinegar mixture for 5-10 minutes in order to absorb flavor and liquid is almost reduced to 1/2 cup. Add cold rice, crumbling it into the skillet. Fold the rice into the chicken mixture to combine. If the rice sticks, add another tablespoon of oil. you just made my mouth water!!! Delish!!!! You just made my mouth water!!! 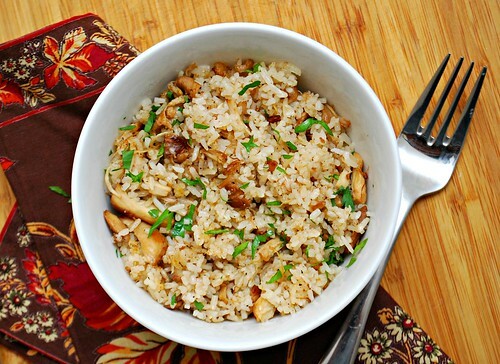 I love fried rice, though I can't say I've ever tried Chicken Adobo Fried Rice. It looks really yummy! This looks great! I will have to save this and give it a try! This is the first time I have heard of this recipe - it looks delicious! Funny, if you ask my guy what he wants for dinner, chances are he'll respond with "pasta!" Simply amazing. And it really looks good too! How do you exactly cook that? Can we use beef or maybe pork to make that?